I have a dream that on the 50th anniversary of the March on Washington, little black boys and girls will be holding hands with little white boys and girls as they watch the footage on TV of Martin Luther King Jr. delivering his famous words. I have a dream that on the red hills of Georgia, the great-grandsons of former slaves and the great-grandsons of former slave owners will be able to sit down together at the table of brotherhood this week, open their MacBooks and pull up the seminal speech on the internet. But that speech is not free, alas. It will not be in the public domain until 2038, 70 years after King’s death. Until then, any commercial enterprises wishing to legally broadcast King’s iconic “I Have a Dream” speech, delivered August 28, 1963, on the National Mall, or reprint its words must pay a hefty fee. CBS and USA Today learned this the hard way in the 1990s, when both reached undisclosed settlements with King’s estate after using the speech without permission. Intellectual Properties Management, the King family business that works in conjunction with music company EMI Publishing to license King’s copyrighted image and works, did not respond to an inquiry from Mother Jones about the cost of hosting a video of the speech on our site. 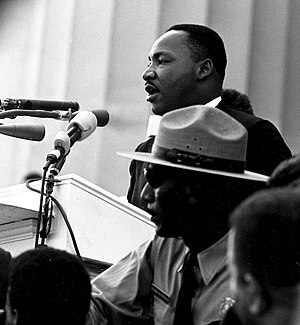 via I Have a Copyright: The Problem With MLK’s Speech | Mother Jones. This entry was posted in News from the Soul Brother and tagged business, copyright, EMI, March on Washington for Jobs and Freedom, Martin Luther King, National Mall. Bookmark the permalink.